This window allows the user to control and monitor each battle. Rectangular - a single display area is at the top of the window (see above). Location zero is at the upper-left corner of the area, and increasing core locations move left to right, then top to bottom. Circular - four display areas are arranged around the outside of the window (see next page). Location zero is at the upper-left corner of the left-hand area, and increasing locations go counterclockwise along the four areas. Each memory location in the Core is assigned a block on the screen. The color of each block reflects the contents of the corresponding memory location. Each warrior is assigned a distinguishing color. Black represents empty core, and gray is an unused portion of the graphics area, not part of Core. A red spot marks the process of each warrior that will execute next. For large Core sizes, only the first 262,144 locations (131,072 for rectangular topology) are visible. Clicking anywhere in the display area will open a Core View window at that location; or, if one is already open, will change the location of the most recently used Core View window. The range of instructions shown by each open Core View window is marked with a red underline in the Core display. This area displays the key battle parameters and the status of the current battle. Core size is the size of Core for the current battle, and Max Cycles is the number of instruction cycles per warrior before a draw is declared. Battle Status can be In Progress, Stopped, Drawn, or Won by one of the warriors. The Completion progress bar shows the percentage of Max Cycles that has elapsed. Tournament progress is also shown in this area. The tournament type can be Melee, Round Robin, Benchmark, or Challenge. (See the Settings section for a description of the tournament types.) The number of rounds that have been fought between the current matchup (combination of warriors) is shown, as well as how many matchups have taken place. The Show Results button brings up the Tournament Results window. This may be viewed at any time during a tournament. The right-hand part of the central area contains one row of controls for each warrior, up to eight. Warriors beyond the first eight may be accessed through the warrior list in the Settings dialog. The name of each warrior is shown in a button; clicking this button brings up the Edit Warrior window. The color bar at the right shows the color of this warrior, and the current number of live processes. The progress bar shows the number of live processes as a percentage of the maximum allowed (which is shown at the top of this area as Max Processes). When CoreWin is first started, no warriors have yet been loaded, so the warrior area is empty. When the source code of at least one warrior has been loaded using the Settings dialog, the warriors that will participate in the first matchup are automatically compiled and a new battle is set up. If one or more warriors fail to compile properly, the user is notified and the battle cannot be started. The controls at the lower left part of the central area control the battle and bring up other windows. · The Setup button brings up the Settings dialog, which allows the user to set the various parameters that govern the battles. Note that setting new parameters aborts the current tournament and sets up a new one. · The Options button brings up the Options dialog, which allows the user to change certain display options. Changing these options will not interrupt the current tournament. · The New Battle button sets up a new tournament: all warriors are compiled, all Core locations are set to zero instructions (DAT 0, 0) or a custom instruction, the warriors are loaded into Core, and the Start and Single Step buttons are enabled. · The Start button starts or resumes a battle. · The Stop button temporarily halts a battle. · The Single Step button executes one instruction of each warrior, and then stops. · The View Core button opens a Core View window that shows a close-up view of the instructions in Core. This window is non-modal, so that it can remain open while the battle is running, and the battle controls can still be used. It updates in real time as the battle progresses. Multiple core views can be opened; a new core view window opens each time the View Core button is clicked. · The View P-space button brings up the P-space View window that shows the contents of P-space for any warrior. 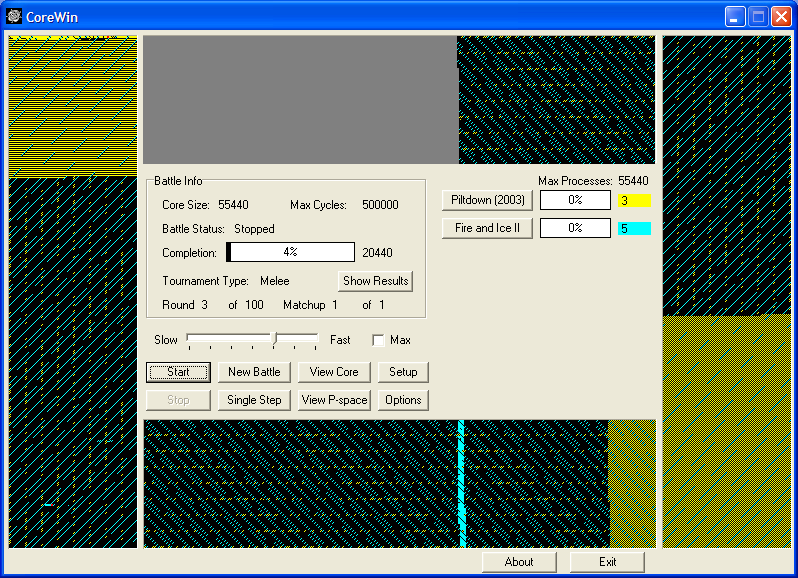 This window is non-modal, so that it can remain open while the battle is running, and the battle controls can still be used. It updates in real time as the battle progresses. · The Speed slider control, above the buttons, controls the speed at which warrior instructions are executed. There are seven speed levels. The slowest three speeds are fixed at 4, 20, and 100 cycles per second. The speeds of the four highest settings depend on the CPU speed of the computer running CoreWin, on the warriors involved, and on the display option selected. For faster speeds, turn off all display graphics by selecting the “None” display option (see the Options section). · For the fastest possible speed, check the Max checkbox. This sets the speed slider to maximum, turns off all graphics displays, and disables all breakpoints.